New Orleans is steeped in history and loaded with unique and irresistible charm. 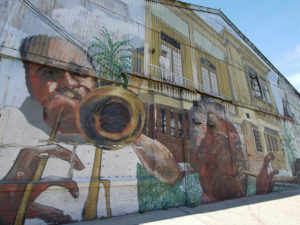 One of the most exciting parts of this Louisiana, USA city is its vibrant Arts District. Today, we’re going to share information about where the Arts District is situated, which key attractions are found there and which famous artists come from the area. Once you’ve learned more about the beautiful and diverting Arts District, we recommend planning a visit. It’s such a great place to drink in culture and beauty. It’s a perfect place to explore…and to enjoy life. The Arts District is right in the center of the downtown core, so it’s very simple to find. This Crescent City district used to be an industrial area. If you were there during the 19th century, you would have referred to the area as the Industrial District and you would have seen produce, grain and coffee coming into the neighborhood via the city’s port. Over time, the industrial prosperity of the area dwindled. For decades prior to the mid-1970s, the area was quiet and almost deserted. When the Contemporary Arts Center opened its doors during 1976, the area became revitalized. Slowly but surely, the area turned into a popular cultural hub. Since there were so many roomy warehouses in the region, artists definitely saw the potential. They flooded in to show their wares in the local warehouses…and the rest is history! Today, the Arts District is home to a range of wonderful galleries. Three top galleries to stroll through while you’re in the area include Arthur Roger Gallery, George Schmidt Gallery and Galerie Simonne Stern Gallery. This trio of popular and respected galleries is found on Julia Street, which is definitely the area’s “high street” for art. We also think that you should visit the The National World War II Museum. If you want an exceptional meal between gallery visits, consider Herbsaint on St. Charles Avenue. It offers traditional Creole food that is truly mouth-watering. Another great option for fine dining is Compere Lapin on Tchoupitoulas Street, where exquisite French cuisine is always on the menu. If you want something more casual which earns tons of accolades from tourists and townies alike, visit Carmo (A Tropical Bar and Cafe) on Julia Street. It’s got some wonderful vegan and vegetarian options, as well as fabulous choices for carnivores. Shopping is also a grand adventure in the bustling Arts District. Shops to peruse as you explore include the many galleries, most of which definitely sell paintings and other works from art, which are often produced by NOLA artists. Also, check out Haute Women’s Boutique on Magazine St., for glamorous high fashion looks which are sometimes difficult to find elsewhere in the Big Easy. Two other fun shops to browse include Friend (for men’s clothing) and The Stacks (Art and Design Bookstore). One famous artist who put down roots in New Orleans was the late John James Audubon. He came to NOLA in 1920, with his wife. They had no money and he began to sell his sketches in order to support them. Audobon is best known for his masterly book of avian sketches, known as Birds of America. Regionalist printmaker and painter, John McCrady and painter, Ida Kohlmeyer, who was inspired by the Abstract Impressionists, also lived in the Big Easy. We hope that this quick guide has inspired you to plan a trip to the New Orleans Art District. We know that you’ll enjoy your time there.